Miss Berry informs Mr. Alston that the boys and girls enjoyed the visitor he had sent. Also, plans are set to try to find ways to collect more money for the Berry Schools. 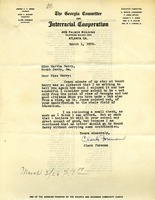 A letter from Clark Foreman of the Georgia Committee on Interracial Cooperation to Martha Berry and Berry Schools. Mr. Foreman visited Berry and praises Ms. Berry for her contributions to the field of education. Included was a ten dollar donation. Martha inquires to Mr. Alston how many of the Atlanta Trustees will be coming. 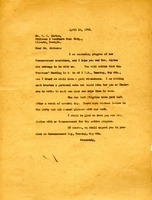 She also notes that there are a good deal of diplomas not signed by Mr. Alston yet. 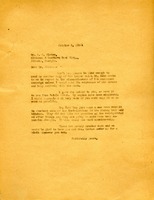 The document was a letter from Martha Berry to Mr. R.C. Alston. 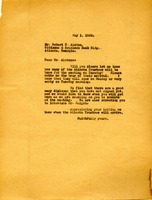 The letter requested the Mr. Alston to urge other trustees to attend an event. From the writing the event was probably very important and with Berry's history involved trying to get donations.